PDEA Region 8 Acting Regional Director, Edgar T. Jubay was one of the guests during the Opening of the Baybay City Day-time Therapeutic Community Center located at the New Baybay City Library, Diversion Road, Barangay Gaas, Baybay City, Leyte. 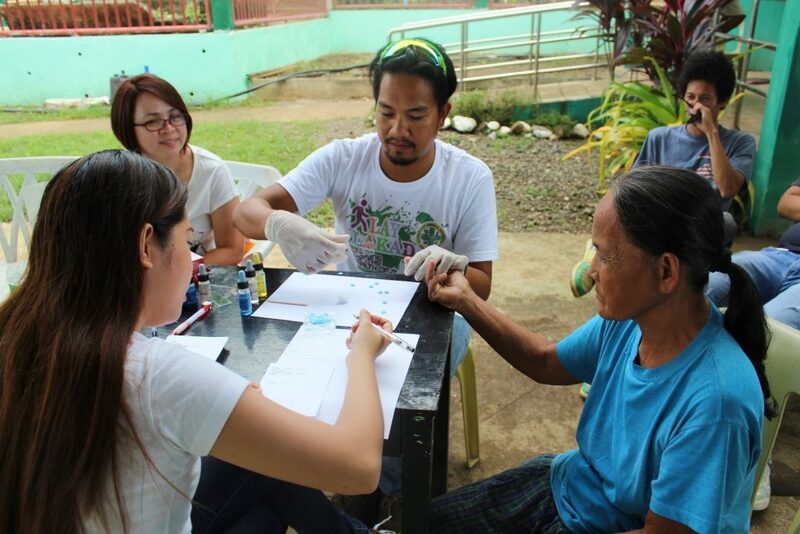 The Local Government Unit (LGU) of the city launched the Baybay City Day-time Therapeutic Community Center (BCDTCC) located at the Diversion Road, Barangay Gaas, Baybay City, Leyte almost a year ago. It was one of the highlights of the Kick-off Ceremony of the Drug Prevention and Control Week Celebration in the city on November 14 last year. Thus, in a few days, it will be celebrating its first anniversary with high hopes for renewed lives for the recovering drug dependents of the city. 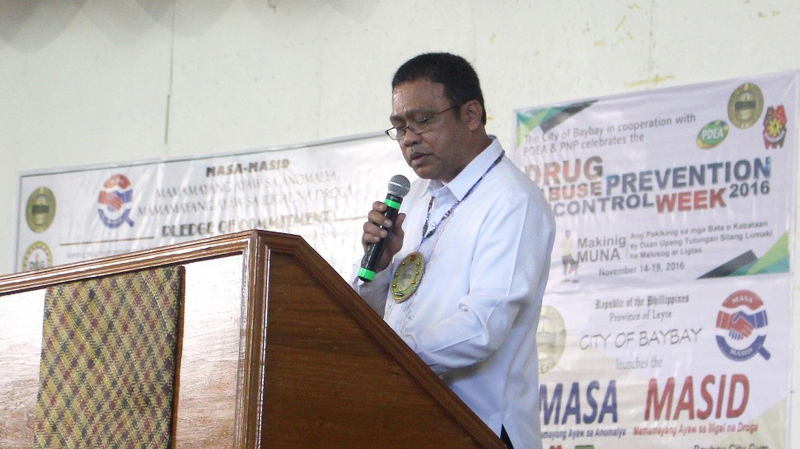 Dr. Noberto P. Oja Jr., Medical Officer V and BCDTCC Head, revealed that 2,252 drug dependents in the city responded to the “Oplan Tukhang” of the Philippine National Police (PNP). And as of July 15, 2017, 659 of the surrendered drug dependents have been assessed by the Drug Assessment Team of the City of Baybay and were categorized as Low Risk (238), Moderate Risk (262) and High Risk (159). According to Dr. Oja, the high-risk drug dependents are the target clientele of the Baybay City Day-time Therapeutic Community Center, while those who were categorized as moderate and low risk drug dependents will be taken care of by Masa Masid Program which will be spearheaded by the Department of Interior and Local Government (DILG) and the Oplan Sagip Program of the Department of Health. Thus, since its operation in November of last year, two (2) batches of recovering drug dependents (RDDs) had finished their six (6) months therapy at the BCDTCC. The first batch started with 23 RDDs but only 18 RDDs graduated in June 19, 2017; then only 6 of the 8 RRDs graduated from the second batch last August 11, 2017. The third batch of 23 RDDs started their six months journey in July 17, 2017 and hopefully none of them will drop out from the therapy. Dr. Oja revealed that the activities in the Day-time Therapeutic Community Center include Case Work and Individual Counselling, Group Work and Group Counselling, Recovery Skills Training Session, Faith-based Session, Family Counselling, Referral Services and Conduct of Dialogue with the parents of the Recovering Drug Dependents. But after the six (6) months therapy, he said that the graduates will still undergo the eighteen (18) months after care as part of the therapeutic community program. The graduates from the BCDTCC had undergone skills training with the Technical Skills and Development Authority (TESDA) and were given financial assistance by the Baybay City LGU so that they will have something to start with as they re-integrate to their respective communities. The City Mayor, Hon. Carmen L. Cari, is very delighted with the thought that this facility has paved the way to the change the recovering drug dependents have been longing for in their lives. But Dr. Teresita Cajano, the former Chief of Hospital at the Saving Lives at a Common Ground (SALAG) Treatment and Rehabilitation Center in Dulag, Leyte reiterated that, “Although this will not be easy, addiction is never without redemption.” Thus, the drug dependents may always go back to the way they were, if they really want to. This activity is part of the commitment of the Local Government Unit of Baybay to spread the good news about the goodness of brown rice to Baybayanons after winning the 2nd Place on the Nationwide Search for RICEponsible Champions which was spearheaded by the Department of Agriculture Philippine Rice Research Institute (DA-PhilRice). The search was participated in by 24 Local Government Units from the different parts of the country. Along with this prestigious award is a big challenge to the City Government of Baybay to increase awareness about the goodness of brown rice thereby increasing the number of constituents with heathy rice eating habits. The advocacy also intends to improve the access of Baybayanons to affordable brown rice which will eventually result to better health among its constituents. During the said activity, Agricultural Technologist Sopio Rim, Jr. of the City Agriculture Office of the city clarified that brown rice is not a variety of rice, rather it is the product of milling rice using the Pinawa Rice Mill. Agricultural Technologist Rim confirmed this and said that eating brown rice is also good for those who want to trim down their weight because it contains high dietary fiber. He added that, based on experience, brown rice has a 71% grains recovery, compared to white rice which only have a 41% recovery, thus this means more income to the rice farmers in the city. 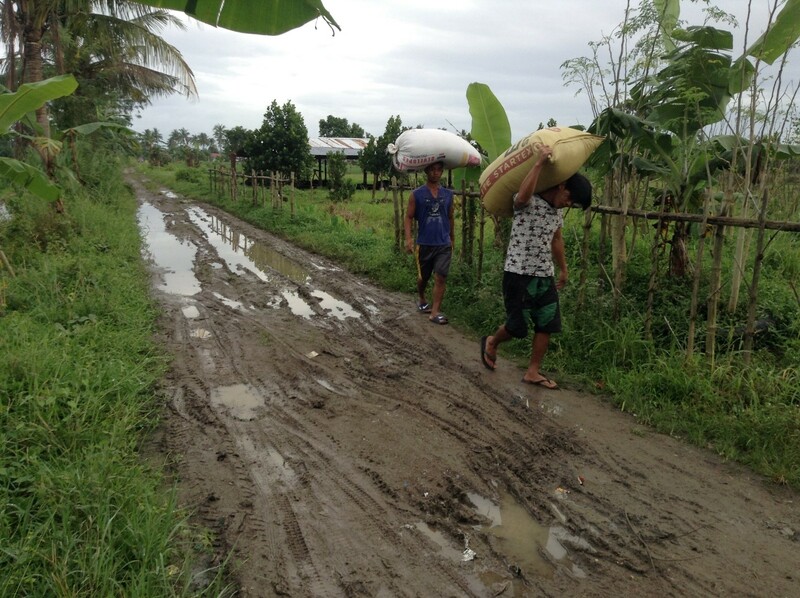 However, since the nearest Pinawa Rice Mill is in the hinterlands of Barangay Dao, Ormoc City, 44 kilometers away from Baybay City and could not be reached by a vehicle, the members of the Banahao Rice Farmers Association, from Barangay Banahao, Baybay City, Leyte, walked for almost a kilometer with the sacks of rice on their back just to be able to bring back home brown rice for their awaiting consumers. This, according to Agricultural Technologist Rim, is the reason why the cost of brown rice in the City of Baybay is a little higher than that of white rice now. Thus, the Banahao Farmers Association is currently working on a proposal to establish a Pinawa Rice Mill in their own barangay which shall provide milling services to six (6) adjacent barangays. The funding for this project shall come from the Bottom-up Budgeting Sustainable Livelihood Program (BUB-SLP) of the Department of Social Welfare and Development (DSWD), thru the Local Government Unit of Baybay City. If this project prospers, a healthier and chemical-free rice product will be available for the rice consumers of the City of Baybay. And because the rice mill will be established in Barangay Banahao, brown rice will then become more accessible and affordable to the consumers. The RICEponsible Team also conducted the same awareness campaign in Villa Mag-aso Elementary School with 117 pupils, Gacat Elementary School with 250 pupils, and Plaridel Central School with 635 pupils. According to Head Nurse Ms. Jeanne Araneta of the Baybay City Division, these are the schools with the most number of malnourished children in the City of Baybay thus, the management thanked the Be RICEponsible Team for conducting the said activity in their school. The City of Baybay was the only Local Government Unit (LGU) in the Province of Leyte which was included in the Top 100 Boat Registration (BoatR) Program’s Best Performing Cities and Municipalities by the Department of Agriculture-Bureau of Fisheries and Aquatic Resources (DA-BFAR). As a reward, the city’s fisherfolks, through its Coastal Resources and Fishery Management Office (CRFMO), will receive two million pesos worth of fishing boats and fishing paraphernalia to be used in its various programs and projects, including on the rehabilitation of the marine sanctuaries in the city. It could be recalled that the City of Baybay had established eleven (11) marine sanctuaries, many of which need rehabilitation. These said marine sanctuaries are in following coastal barangays: Barangay Bitanhuan, Barangay Plaridel, Barangay Punta, Barangay Gabas, Barangay Hilapnitan, Barangay Marcos, Barangay Palhi, Barangay Sta. Cruz, Barangay Maybog, and Barangay Pangasugan; while another marine sanctuary was established along the shoreline of the Visayas State University (VSU), the premier university for science and technology in the Visayas. The ceremonial awarding of the Top 100 Boat Registration (BoatR) Program’s Best Performing Cities and Municipalities, with representatives from the DA-BDAR Regional Office, was held on June 4, 2017 at the Padre Burgos, Southern Leyte’s municipal grounds. It can be recalled that Baybay City has a total number of 2,827 fisherfolks and all of them are registered in the Fish Registration System of DA-BFAR and all those with boats of 3 gross tonnage and below are also registered in the BoatR System. Thus, during the 10th Charter Day of Baybay City, the City Fishery Officer, Mr. Ruben Mercado Jr. (5th from right), with Baybay City Mayor Carmen L. Cari (beside Mr. Mercado) and Vice Mayor Michael L. Cari (beside the City Mayor), facilitated the ceremonial turnover of pump boats and fishing paraphernalia to pre-selected recipients from the coastal barangays of the city. And according to Mr. Mercado, they distributed 30 units of pump boats and fishing paraphernalia that day.